This incalmo wallbowl features 2 separate sections that come together to form an absolutely stunning piece of glass wall art. Each section was formed as its own separate molten bubble, then they were fused together and blown out as one unified bubble using the incalmo method. The outer section was made from hand pulled canes of pinks, gold topaz, and many shades in between while the inner section was made with a fiery bubble with a deep gold topaz core. 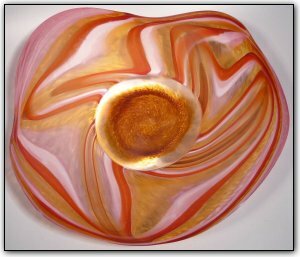 Wall bowls can be hung on a wall just like a picture or they can also be set out as a table bowl as well. To hang the bowl on a wall, all you need is a secure hook on the wall and a hanging apparatus comes along with the bowl. Hanging the bowl is a breeze and should take less than 10 minutes. You won't believe the compliments you are sure to receive when displaying this absolutely stunning wall bowl!